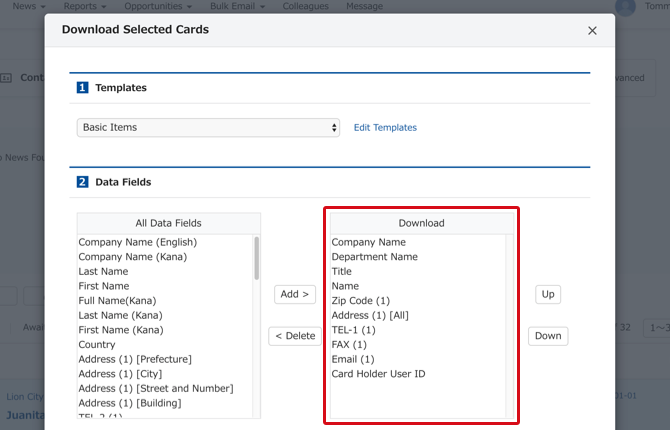 Following are instructions on how to download (export) business card data. Downloading can be broadly divided into two categories. ・Only business cards that have already been changed into data can be downloaded. ・If the amount of data items being extracted is large, it may take some time to create the file (Generally it will take five minutes for every 1000 business cards being downloaded). * If many files for download are being created by Sansan users, it may take some time before the file creation process begins. ・After the file has been created, a notification email will be sent to the email address of the logged-in user. Even if the user logged-in has permission to download all data, if a business card is private or belongs to a department that cannot be viewed by this user then this data cannot be downloaded. 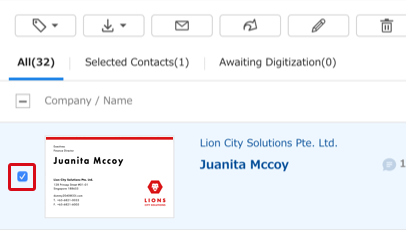 Click on "Download/Send", and then "Download selected business cards". From the Download selected business card screen, you can select items and options. For more details about options, see here. The following download templates have been prepared. Extract all items / Extract basic items / For importing into Outlook (2000, 2002, 2003) / For importing into Gmail / For linking with Cybozu Office 6 / For linking with eSales Manager / for Fudemame Online If you are going to use these, please specify in this step. Please wait until generation of the download data is complete. You can check this from the List of created files. 1. Perform a business card search from the search box of the home screen or from advanced searches, and the search results will be displayed. * If you wish to download all data, select "All" in the search field. For more information about Advanced searches, see here. 2. 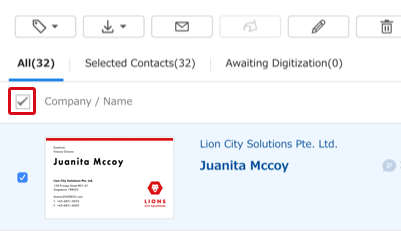 From the search result list, put checks in the boxes of business cards you would like to download. * If you would like to select all the search results spread across multiple pages, please use the check box in the illustration below. When downloading all the data, in the same way put a check here to choose all the business cards. 3. From the download icon, click on "Download selected Cards". 4. From the business card extraction screen, select the items you would like to download, and then click on "Download". You can select templates from the pull down. The "Items to be downloaded" of "2, Edit items" will be extracted. To add items, click on "Add" after choosing the item from the item list. To remove items, click on "Delete" after choosing the item from "List of Items to Be Downloaded". ▼ If you check the details of "options; 3, Choose Options " , see here. 5. Please wait until the file is generated. 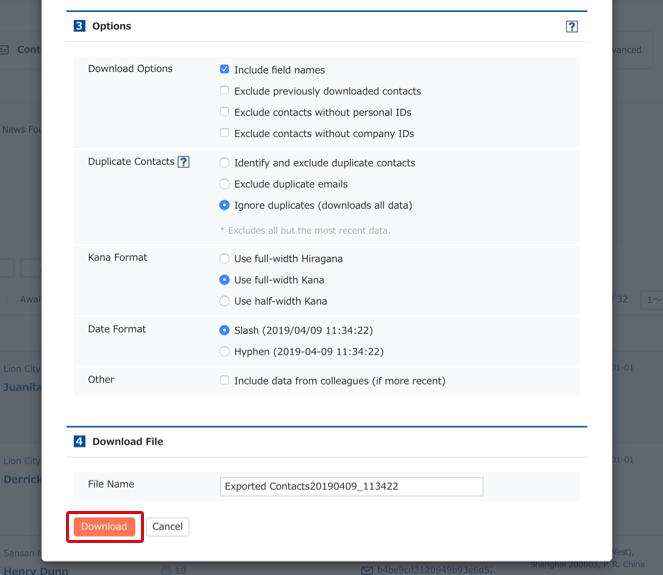 If you click on "Display Current Situation" at the upper left of the download file list, when "Working" changes to a "Download" button, you can then download the business card data.